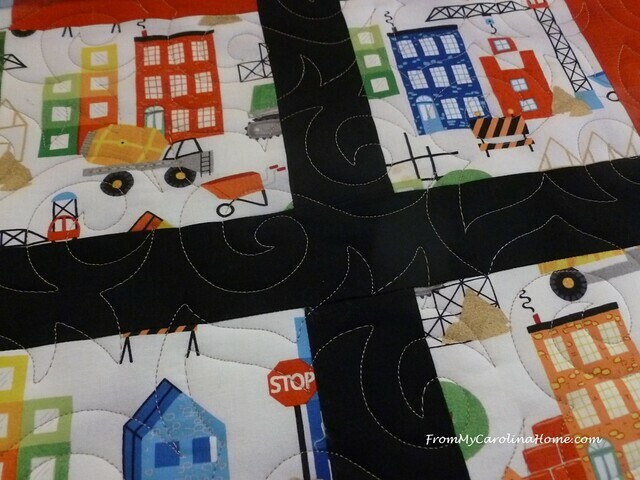 Recently I was asked to do a fun kid’s quilt, with trucks on the front and a city street print on the back. The quilter put borders around the back panel, and asked me to center it on the back. This is a bit harder than it sounds. When the backing is loaded, and the batting is placed, you cannot see the back, so centering the top on the back becomes a math challenge. 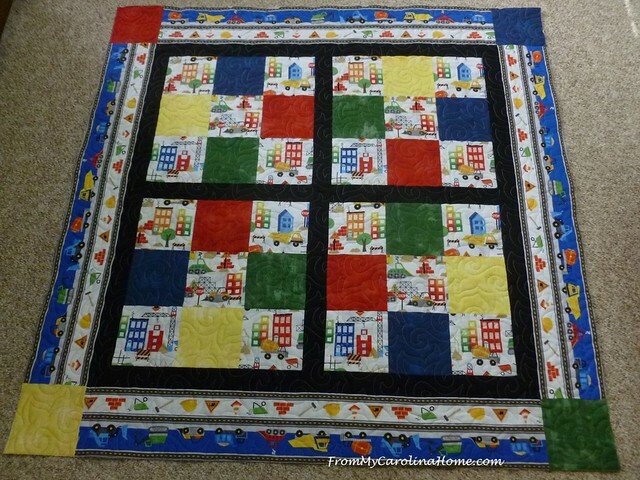 The top is pieced in a nine patch design, with directional borders and black sashing. 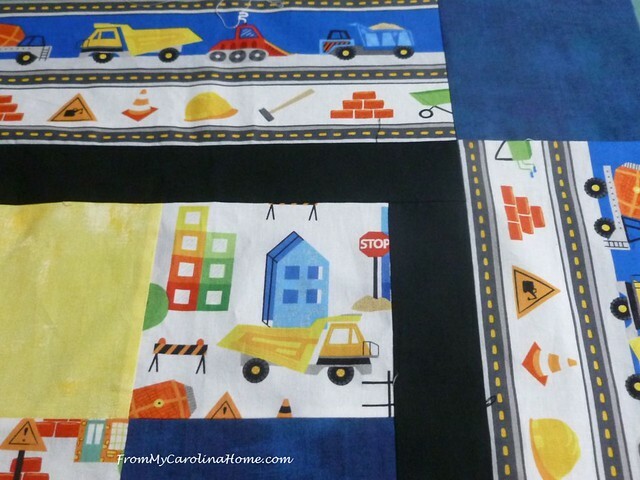 It is adorable for a boy, with trucks and bulldozers, and lots of construction motifs. In order to have a reference point, I folded the back in quarters to find the exact center. I did the same with the top, then put a single loop of red thread on the center point of both the top and the backing. Then I measured both carefully, to see the difference in the top and panel sections, both in length and width. Since both the top and back panel were directional, I need to pay attention to the placement too. 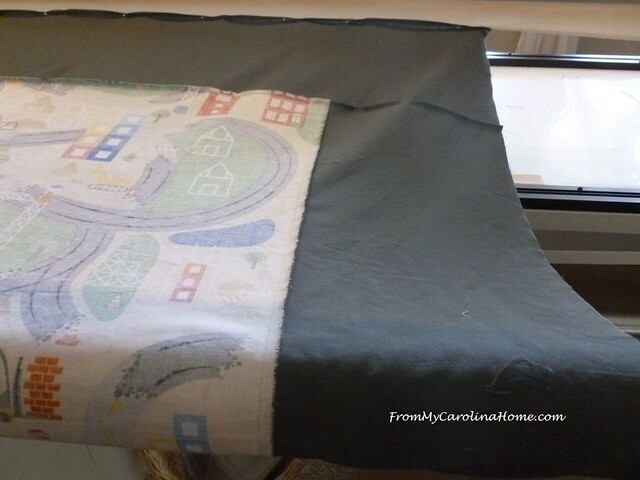 Loading the backing, it is going to be a bit more challenging as the borders have extra fabric at the edge. 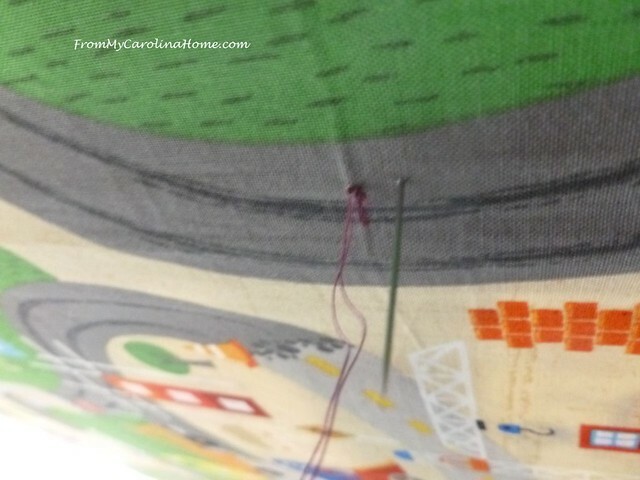 Part of this problem is the bias seams that the maker put on the borders. Never do this. 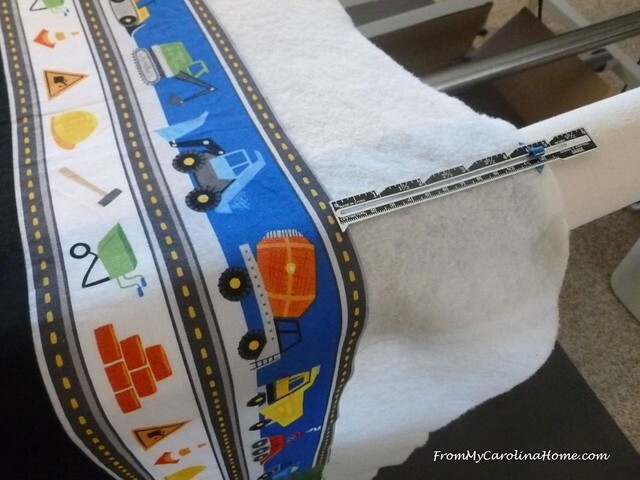 Bias seams only make the borders more wavy and prone to excess fabric at the outer edge. 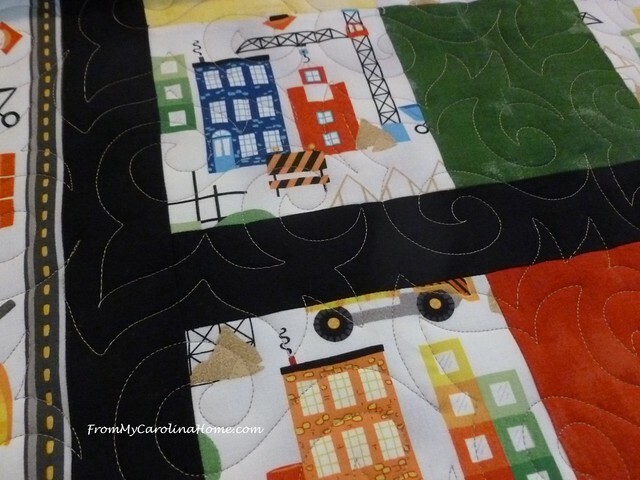 See my tutorial Quilt Borders, Understanding the Why to see the right way to apply borders and why. 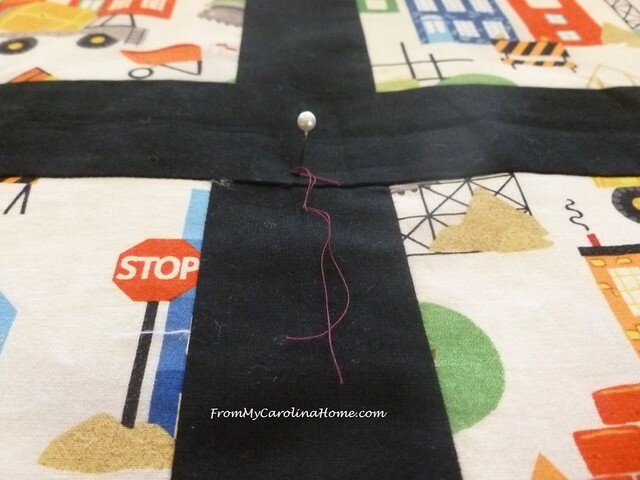 Your border seams should be straight just like your piecing seams. 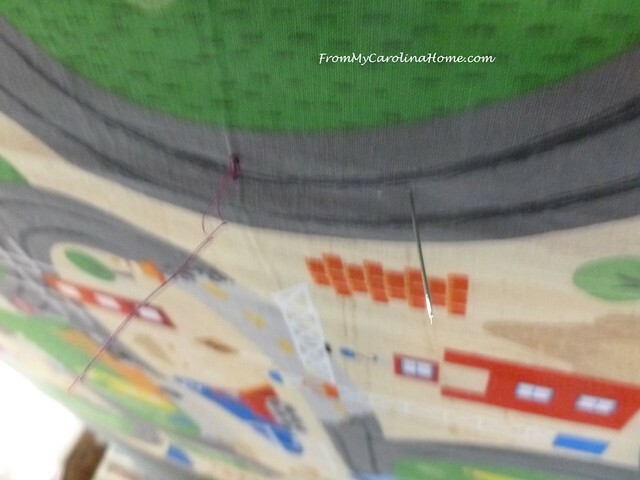 Quilters often forget that bias seams are only for binding, not borders. Making sure that the top seam of the panel is straight, I measured where the top should go from the seam edge up into the border, then added the batting on top. The top was 12 inches longer than the panel back section, so I needed to place the top 6 inches above the panel seam on the back. Math was total difference in length divided by 2, placing half the difference at the top and the other half at the bottom. 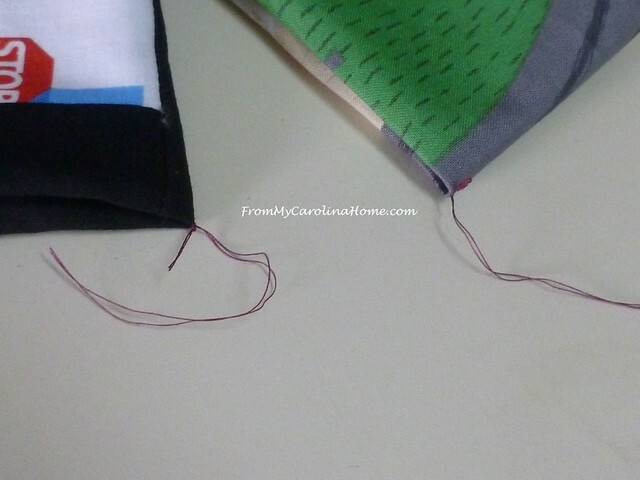 Then I measured the side to side difference so I would know how far from the side seams to place the top. So, I placed the top based on the math, pinned it down, then rolled the bars until the red thread was visible. Placing a pin in that point, I crossed my fingers. Crawling under the frame, I found the pin was really close to the center of the back. Note that it is only about a 1/2-inch to an inch off. 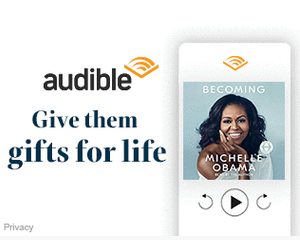 I checked the left/right placement. Then rolled it back again to the top. Here is where I got nervous. Rolling it down to check it again, the pin is now way off. I think just the act of rolling it scooted the top enough to make this much difference. 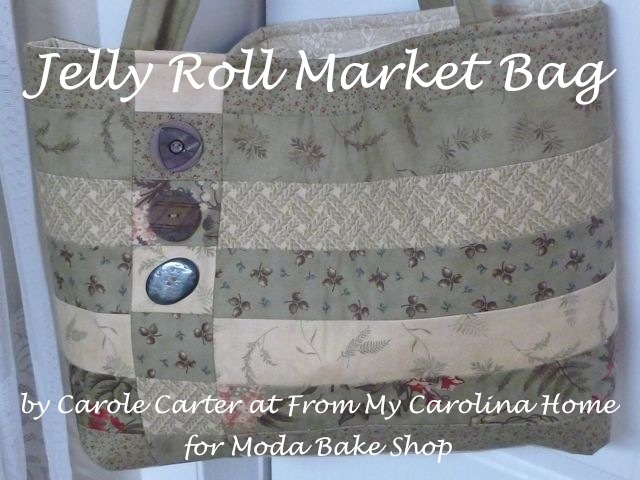 Knowing that the quilting will also draw up the backing, I called my friend Terry to see how she handles this problem. Her answer was to do the math, trust your measurements, scoot the top 1/2-inch higher than you think it should go, and start quilting. Interestingly, this rule of scooting the top 1/2-inch up was almost exactly the difference in the pin check I did first. Trusting her advice, I did just that. I remeasured the top spacing, scooted it up just a bit, and dove in quilting. 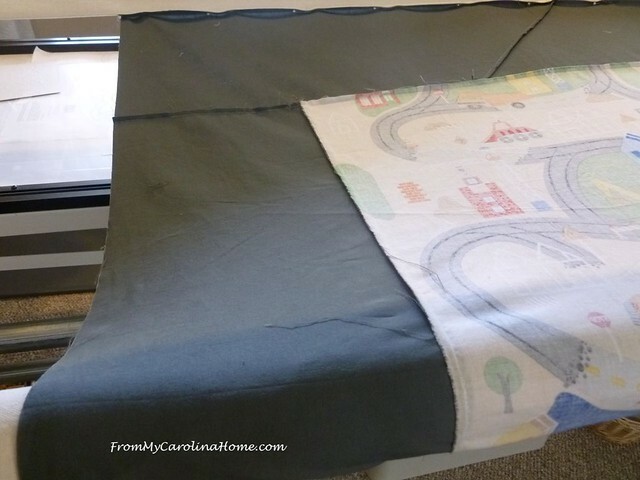 Quilting was done in Glide in a medium grey in both the top and bottom. 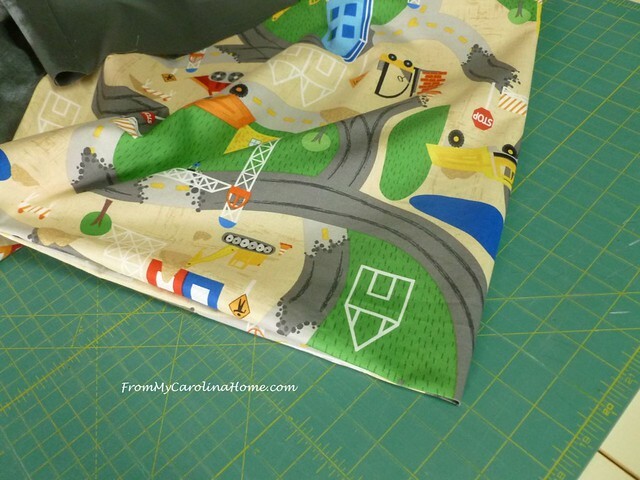 The color blended well with the cute cars and trucks print, and gave a nice texture to the sashing. The pantograph is called Pipeline by Urban Elementz. It quilted up in a short time, and I trimmed it. Here’s the back, not too shabby for centering. It is slightly off center, but I warned her that getting it exactly in the middle wouldn’t be possible. She was happy with the result, and certain that her grandson wouldn’t care. So, that was another learning experience. Every quilt seems to teach me something. What are you working on now? Thanks for the tips. 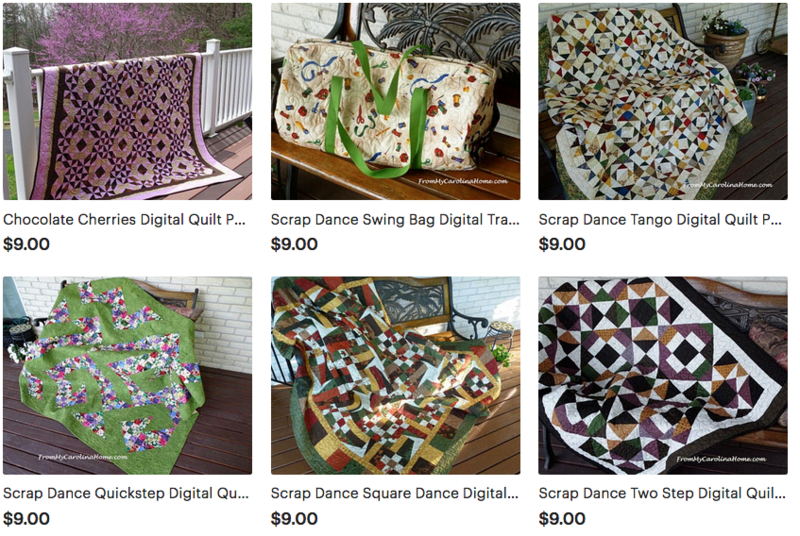 I have a sit down long arm but I still appreciated the comments and can use them when layering my quilts. 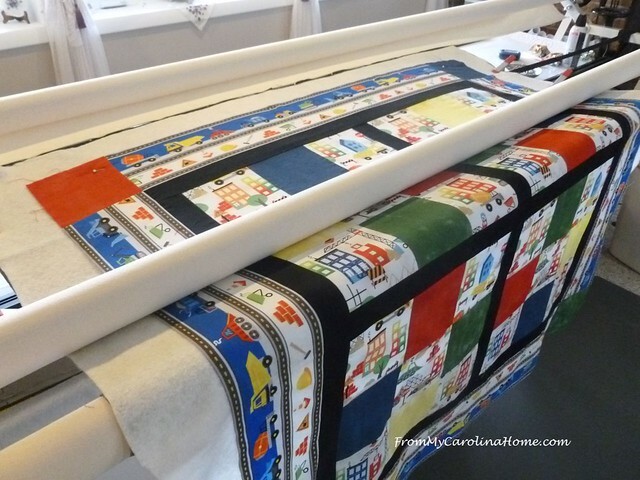 Good morning Carole…..What a cute little boy’s quilt this is, and I’m sure he will be extremely happy with it. I am currently working on a pink crocheted baby blanket with a white crocheted ruffled edge, for a new great grandchild due early next month. That’s a really cute quilt! And thank you for explaining how you did this. Fortunately, I haven’t been asked to center one on the backing yet. I’ll be keeping your tips for when that time comes. Great job! You were very methodical and logical i how you went about this and I think you did a great job! As the mother of two boys and a girl, it was always harder to find fun boy things than it is girls. 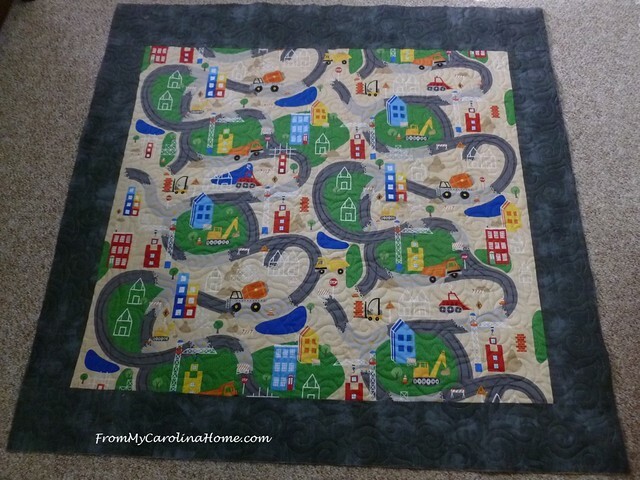 This quilt is super cute! Math is NOT my friend. I’m glad no one has asked me to do this! I appreciate the fact that you took the time to share this with us. Thanks! 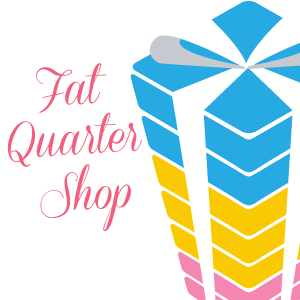 Thank you for detailing the process as I am kicking around the idea of moving into longarming. Great job getting the quilt centered! That is tricky. 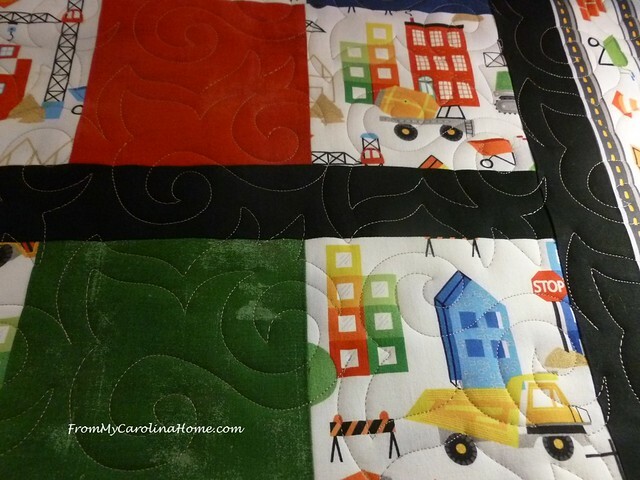 I’m currently quilting a quilt that is already quilted!?! What a cute quilt. I can’t imagine having to figure all that out for centering the back. Whatever the price is, it is certainly worth it. You do such a beautiful job! This turned out really well. 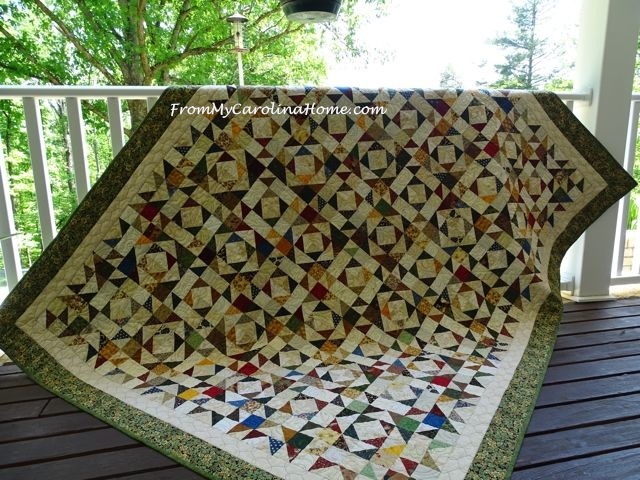 My first quilt, my first and current long arm quilter, Theresa, did all of the work pieced my backing and she cleaned up my quilt, threads and everything. She must have thought I was a slob. She was very nice and did all of this work and made it perfect. I was humbled. I had just forgotten what to do, but she acted like it was no big deal. 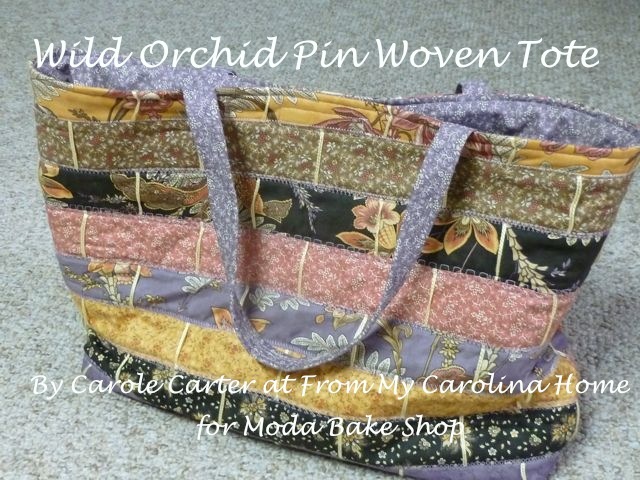 This time I brought her two quilt tops and made my own backings, pieced them 5″ wider on every side. 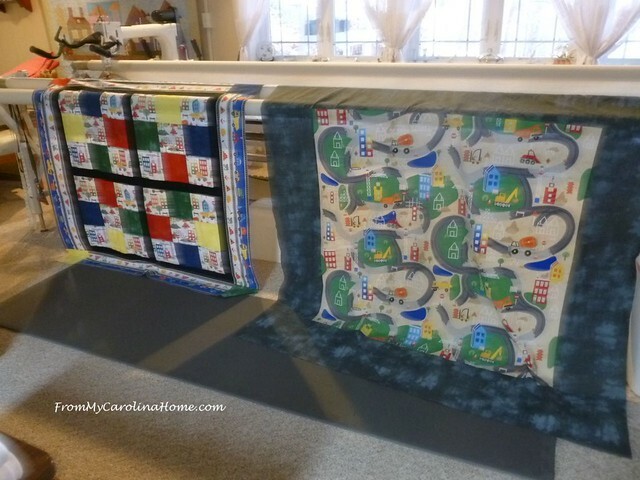 I also (while my tiny 5 month old grand daughter was napping) laid my quilts one at a time, and carefully went over each side, checking for threads, and seams etc. I do not like being a slob. I have never seen bias pieced backings. That is shifty. I probably would have blasted it with heavy duty starch. You centered it very well, it looks great. I have never (and would never) attempt to center a backing. Such great prints! Thanks for sharing your process. 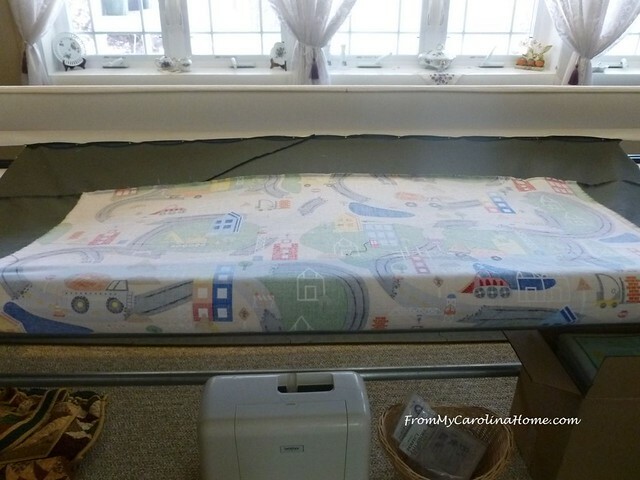 I don’t have a longarm but it’s interesting to see some of the challenges. And I’m sure she’s right that her grandson won’t care if it’s not perfectly centered!! Awesome job! 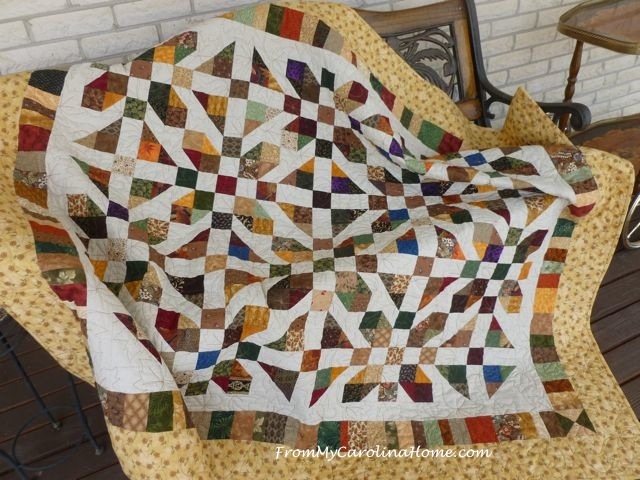 I know that centering a quilt like this is very difficult and I appreciate the tips on how to get it to come out close. Count me impressed! I have a hard time making my quilt backs interesting because by then I just want to get it done.